When I was a kid, all my friends and I, we had corkboards in our bedrooms. We’d tack up photos of friends, ticket stubs, pages from our favourite magazines, random scraps of paper with mysterious meaning—anything that was interesting or important or crucial to remember (according to our 14-year-old selves). Then the Internet came along, with digital cameras close behind, and suddenly paper seemed passé. By the time I went away to university, it was clear the corkboard was headed the way of the dodo. What wasn’t so clear was how to replicate these treasuries online. For a while, I made do with an elaborate (in the sense of many-foldered) system of online bookmarking. But it turns out I have a love/hate relationship with electronic bookmarks: I love filing things and I hate looking back at them. And let’s face it, the words lava cake don’t hold the same allure as a photo, which is why I’m super enthused about Pinterest. I may be off to a slow start, but I think the concept has potential. It’s the online corkboard my inner 14-year-old has been pining for since 1994. 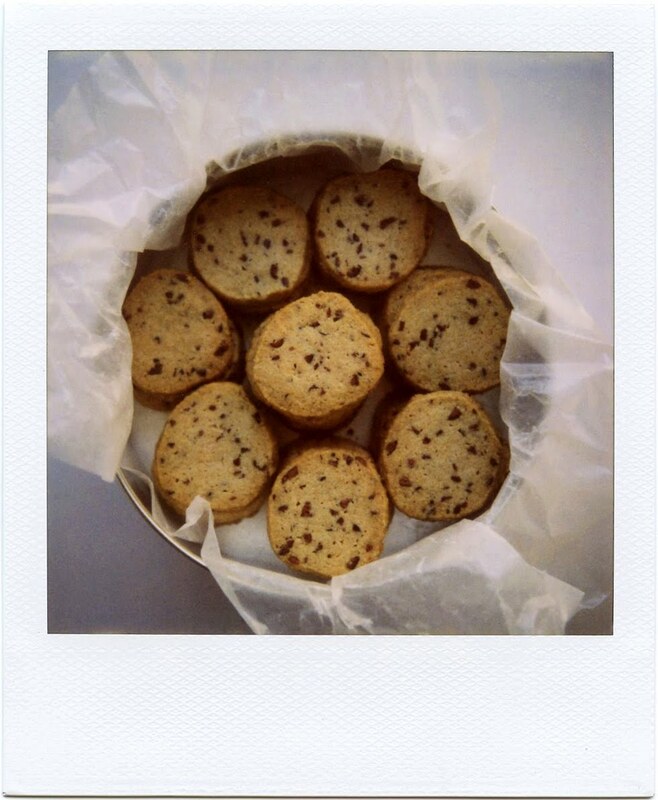 Back in December, I pushpinned this photo of whole wheat sablés with cacao nibs onto my mental corkboard (a considerably less reliable alternative to Pinterest) with the intention of attempting a buckwheat variation. Revisiting the recipe again recently, I noticed that Molly of Orangette had a similar buckwheat brainwave…more than three years earlier. What follows is a bit of mixing and matching. In a small bowl, briefly whisk together the all-purpose and buckwheat flours. Set aside. In a medium bowl, use an electric mixer to beat the butter, sugar and vanilla until creamy and smooth. Add the nibs and beat briefly to incorporate. Add the flour and mix just until combined. Use your hands to lightly knead the dough a few times until it forms a ball. Put the dough inside a medium or large Ziploc freezer bag. Use a rolling pin on the outside of the bag to create a 1/4-inch thick rectangle, pushing the dough into the corners and smoothing the surface. Take a look at the technique here, if my instructions aren’t clear. Refrigerate for at least 2 hours, or overnight. Preheat the oven to 350 degrees Fahrenheit. Line two cookie sheets with parchment paper. Use scissors to cut the sides of the Ziploc bag and reveal the cold dough. Cut into squares using a sharp knife. Carefully prick each square twice with a fork, pushing the tines down until they reach the cutting board. Bake for 12-14 minutes, or until the squares are golden brown on the bottoms and edges. Cookies can be stored in an airtight container at room temperature. Notes: This is my second attempt at a buckwheat cookie and, I think, a better result. Source: A buckwheat variation on the Whole Wheat Sablés with Cacao Nibs from Alice Medrich’s Chewy Gooey Crispy Crunchy Melt-in-Your-Mouth Cookies, discovered via Orangette. These look great! It just so happens that my sis in law and I are into cooking with buckwheat and cacao nibs right now, so this is an awesome recipe for us. My cocoa nib bag is almost empty so I’ll have to restock, but I’m so glad you posted a recipe for these. I want to use my buckwheat flour and figure cookies would be the favorite option. Hooray!